Goshiki Onsen; Niseko, Hokkaido, Japan. One of the best hot springs near Niseko in Hokkaido is Goshiki (5 colors) onsen which is about 30 minutes from the Niseko Ski Resort. An awesome spot for relaxing tired muscle from the snowbording/ski at nearby Niseko resorts. is well known for the black water. It's hard to believe but there are a number of natural hot spring baths, or onsen in Tokyo. There are tens and thousands bath houses in Tokyo but most of them are not the natural hot springs except few. In Japan, all bath houses must identify their source of water (heated city water or natural hot spring) by law so it's easy to distinguish the real thing. Azabu retains an almost bucolic charm that can't be found any other cosmopolitan in the world. The hot spring's setting is most urbanized by locating on the 3rd floor (surrounded by tall building forest) and unsophisticated interiors (tatami floors) but given the fact that the hot spring was famous for many hundreds of years and still surviving after Tokyo became the largest cities in the world. 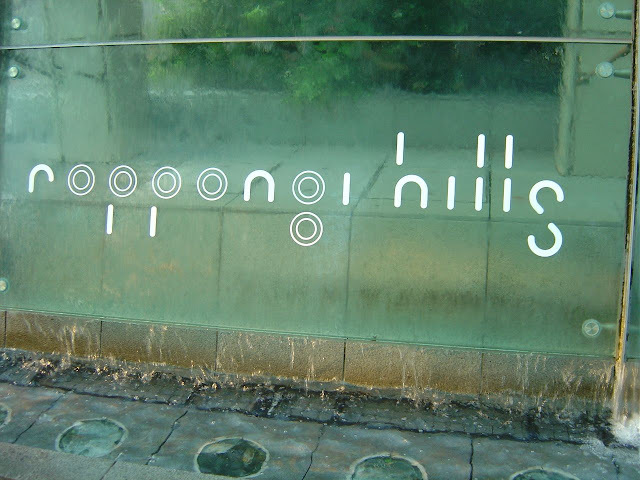 Azabu-Juban hot spring's black water bubbles up to the third floor from 500 meters underground. Its settings and surrounds are not appealing when you compare to the most of beautiful Japanese Ryokan style hot springs but since it's in the smack middle of the busy city, it's significant. The bathing complex includes a sento (public bath) on the first floor, another spring-fed bath on the third floor, a small sauna, a food shop, and a tatami (rice-mat)recreation room where karaoke performances are sometimes held. Men's and women's bathing facilities are separate. is located 1,800 meters above sea level on the slopes of Mt. Kusatsu Shirane. t's an alpine hot spring village in Joshinetsu highland national park. You can reach here through Kusatsu onsen or from the main highway from Tokyo. This place is best to visit in the winter time. 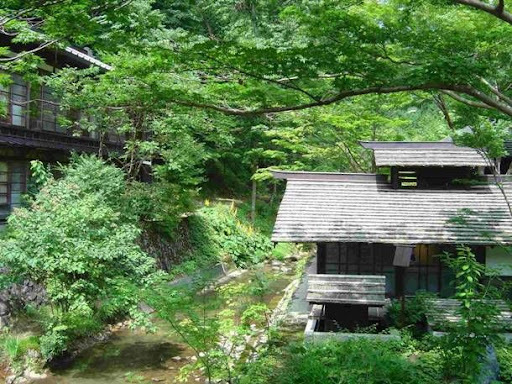 Manza onsen is know for the high ozone content of the mountain area (there are so many vacation homes around there) and rich minerals (milky water means hydrogen sulfide) that supposedly good for the body. Manza has one of the best ski slopes in central Japan and the Manza prince hotel's great mixed bath outdoor rotenburo is well known for its beauty as well as the people who visits there. Manza Prince Hotel Manza Onsen, Manza, 377-15 Phone: +81 (0) 2799 73111. Most of hotel's hot spring use fee is included in the fee unless you use it separately like day use and its fees are normally 800 yen to 1200 yen. Manza Onsen hotel's (http://www.manza.co.jp) Gokuraku Yu hot spring (above left) has the finest view. 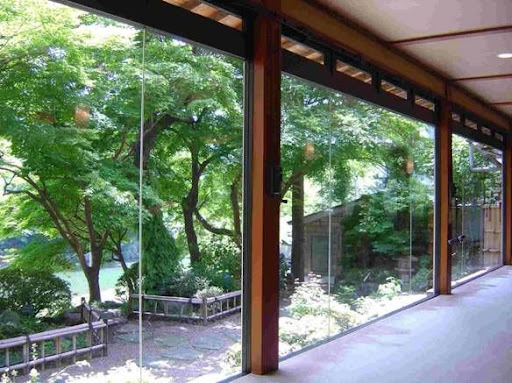 It is located on a covered balcony with a beautiful view of the Shirane mountain range. Sake is best for the night before snowboarding and milky hot spring after the snowboarding. I often take plastic bottle of good sake then leave it in the hot onsen water to warm for several minutes before start drink. 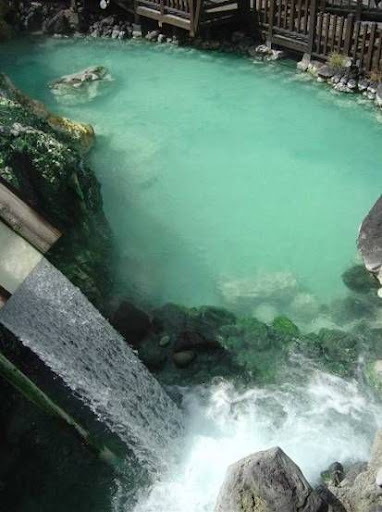 Manza Onsen's milky spring water is most famous around central Japan. Nagano prefecture Nagano city Matsushiro Cho Tojo 55. Tel:026-278-2016. 300 yen. The ichi ryokan has the wide garden and the middle of the garden is where the Matsushiro hot spring is locating. The hotel was opened over 800 years ago and operating continuously ever since. 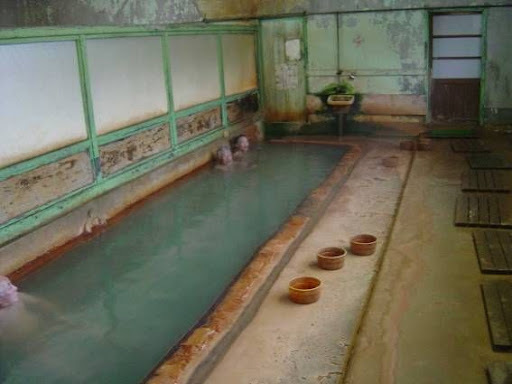 This onsens's setting is very uncharacteristic and it seems the time has been frozen since 1920s but it has high quality of mineral contents such as carbon dioxide so it's been well known for curing skin problems especially burn victims during and after the WWII. The ryokan has no business atmosphere and retained the feeling of old bath house and there's no signs of sightseer is felt. Changing room at the ichi ryokan onsen - simple as a plastic for you where you dump all your belongings without locker or lock. Japan is very trusty society and you don't hear much about thieves. 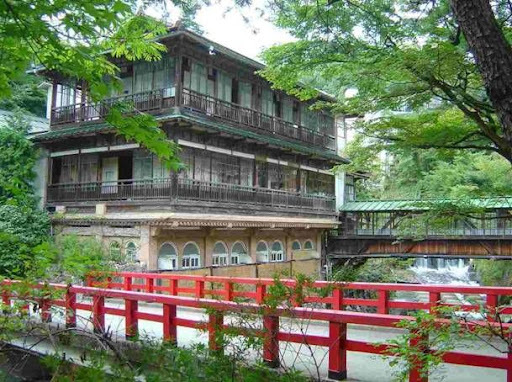 Kusatsu Onsen is one of Japan's most famous onsen resorts. 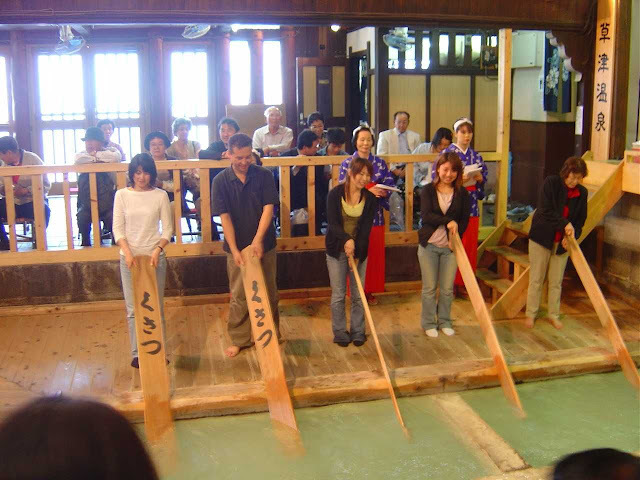 The entire city of Kusatsu produces an output of as many as 37,000 liters of hot onsen water per minute, and while being equipped with modern facilities, there are around 10 communal small spas throughout the city that are open to public without fees which is the traditions unique to Kusatsu. Next to the central onsen Yubatake, there's a place for a traditional cooling process and dancing and singing theater that you must visit. 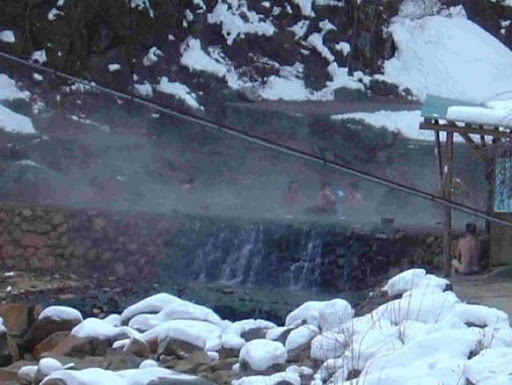 Such communal spas like Kikan-yu, Yu-momi and others are treasures of onsen lovers. Kusatsu Onsen is blessed with large volumes of high quality hot spring water that suppose to cure every illness but lovesickness. Probably the best onsen in Kusatsu - Ohtakinoyu. There are several dipping tubs inside ohtakinoyu that you can taste in different tempetyre. Well known as hot spring resort for many centuries, Kusatsu's fame was further boasted by German doctor Erwin von Baelz, who served at the imperial court in the late 1800s and recommended Kusatsu for its water's health benefits. 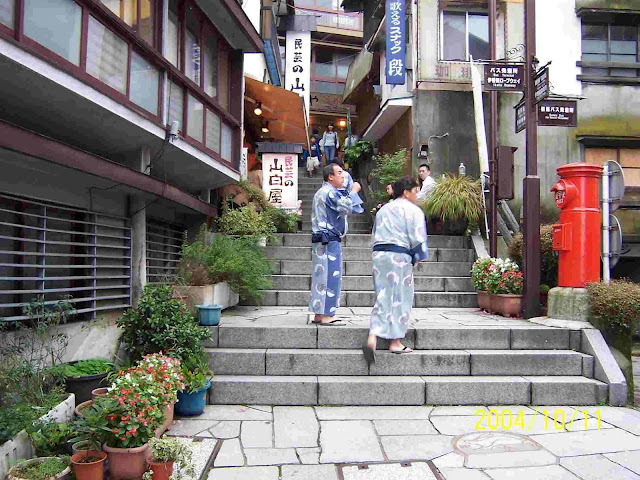 Ikaho onsen is locating in the central part of Gunma prefecture north of Tokyo and have a very unique charm in the middle of the town where visitors can scale a stone staircase Ishidan-gai (the stone steps street) with 360- steps that boasts a history of over 400years. 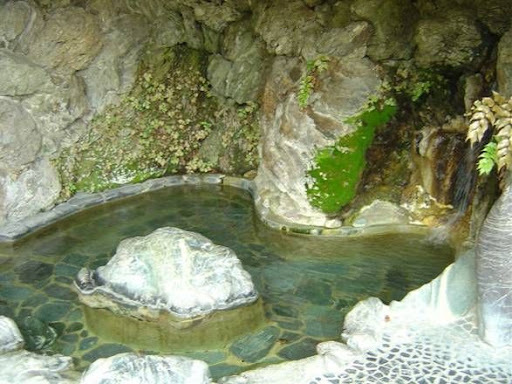 The hot spring in Ikaho was said to have found in the 7th century and the spring is of sulfate and of carbonic acid, and its concentration is so high that it sometimes dyes towels red. The source of the spring is on top of the town hill and feeding the hot spring water to ryokans locating on the foot hills of the Ikaho. 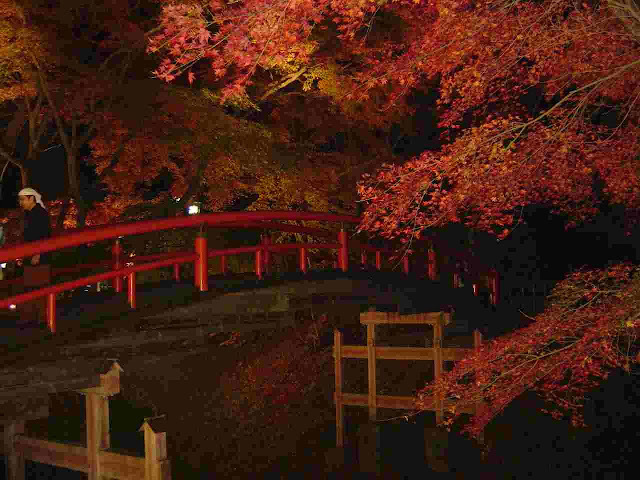 Ikaho’s autumn is well known for its bright red autumn leaves surrounding the traditional Japanese bride near the Ikaho rotenburo. Around $10 fee. 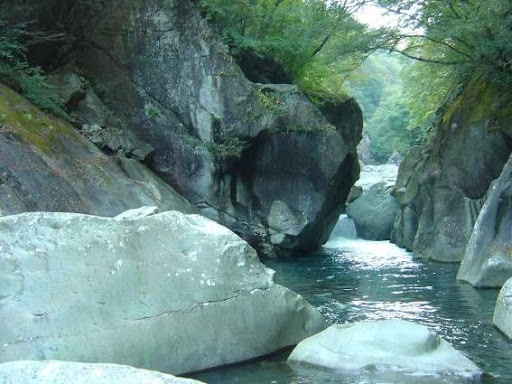 Isobe Onsen is locating near Usui River and its near by Asama mountain is still simmering. The town was start to florishing when the mountain erupted in 1738 which created various sismic shifts and created hot springs. 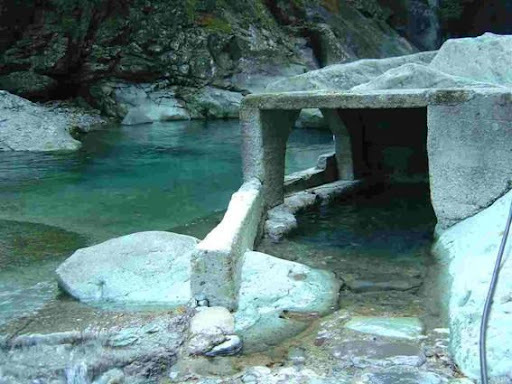 The output of thermal water there is said to have increased as a result of the sismic shifts and well known for enhancing beauty as well as being therapeautic in the treatment of gastric ailments. The area is also known as having given rise to the famous folktale "Shita Kri Susume" (A sparrow whose tongue was cut then later rescued by an old man), which interestingly both Korea and Japan has similar fables. 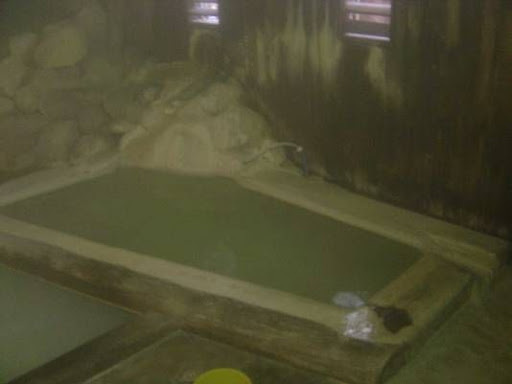 Isobe onsen said to be an inventor of the hot spring mark that is widely used in Japan. Near Isobe locating one of most famous mushroom restaurant where all dishes are mushroom oriented. They are amazingly delicious!! Hoshi onsen was (said to) discovered over 1200 years ago by the holy man Kukai but the Chojukan was built in 1875 for overnight visitors. 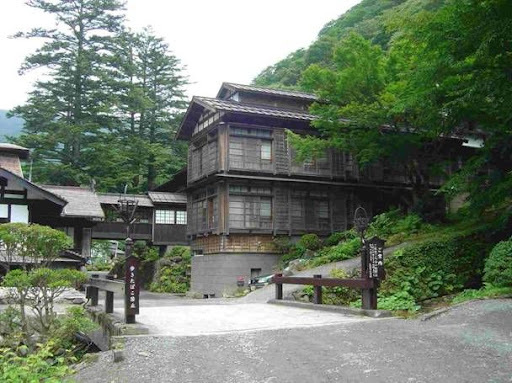 The contry style rustic inn is widely considered as the most beautiful onsen ryokan and most photographed ryokan in Japan. Its indoor wooden building bath is extremely famous for its beauty and elegant arch style window. The bath is large size and has separate changing room for male and female but end up in the same place. It's a mixed bath but the onsen's darkness covers most of the privacy. The large tub is separated by chestnut wood log and the floor is covered by pebble stones. One of the best indoor onsen I've ever visited is Hoshi onsen. The round windows reflects nature's colored rays into the hot spring water then ansenbles into something out of this world feeling. The round chestnut lumber in the middle serves as pillow to further relaxation. Siriyaki onsen is locating near Kusatsu onsen. If you plan to visit Kusatsu, I highly recommend to visit Siriyaki. 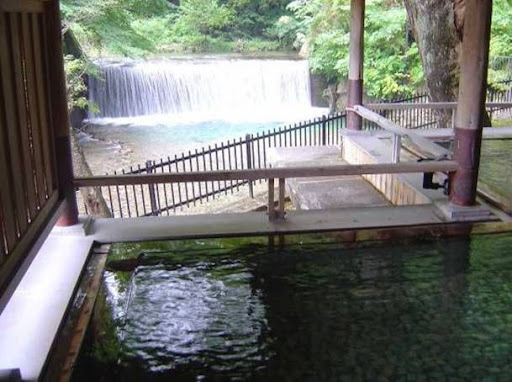 This place is one of the rare primitive hot springs in Japan and the water is just about right by naturally mixing with the cold river water and the hot springs in the middle of it. There's neither light nor any place to change cloth but when sun goes down, there's nothing to see unless you have moon light. Tel: (0279)95-5121 or (0279)95-3111 to locate the area through your GPS but if you want to stay a night; you may want to make a reservation because this is a small town. 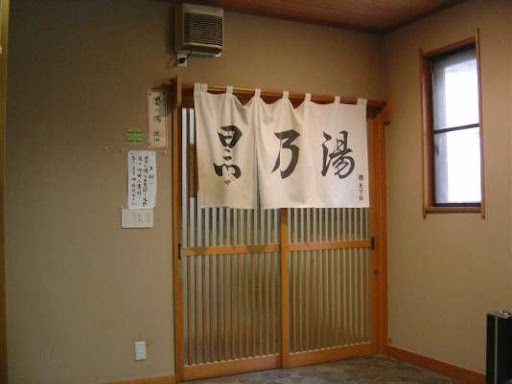 There are only 3 or so ryokans available and mostly young couples who'd like to enjoy tranquility are often come to this place. 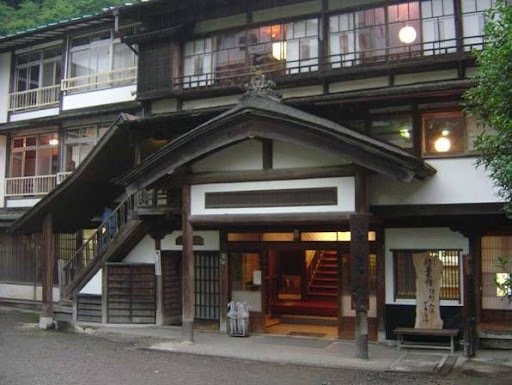 Shima onsen's sekijenkan is oldest hot spring inn in Japan. The ryokan was opened in 1694 and ever since it's been providing heavely thermal water to all sorts of people continuously. 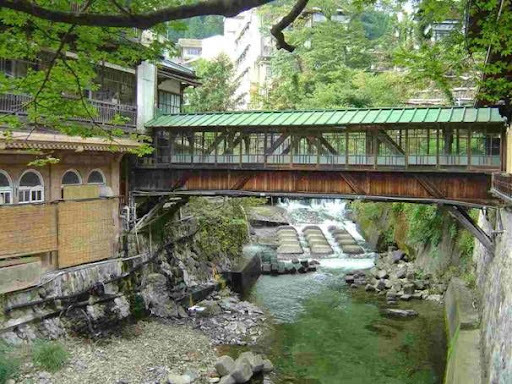 Shima Onsen is situated along the valley of the Shima River where rows of inns line its tranquil streets. 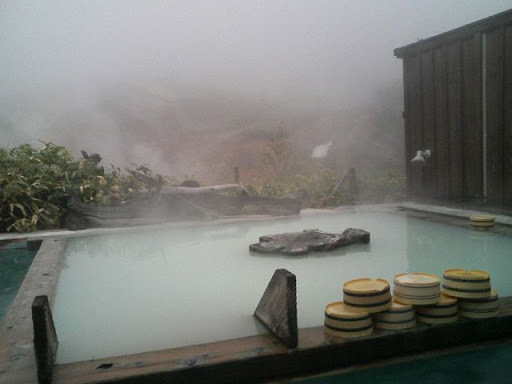 The hot spring water here is said to be effective in the treatment aof as many as 40,000 (shima) ailments. The resort has thus played host to endless visitors seekign the benefit of the healing powers of its waters for as far back as 1,000 years. Shima has several community baths that can be walk around to visit. To get to the beautiful community baths along side of the shima river, I suggets you to obtain the town map from the tourism information office. Most of these comunity baths are mixed baths. Shinto shrine near Shinsuikan - Shinto is a Japanese religion that believes in gods reside in natural phenomena such as trees, mountains, rocks and waterfalls. It has no moral code, no sacred scriptures, nor particular philosophy. All Japanese are somewhat linked to both Budhism and Shintoism by nature and coexist deeply. Buddha was accepted as another Shinto god when introduced in 6th century by Korean across the straight and the two religions are cross crissing throughout Japanese life. Shinsuikan's unique double tub. Each tub has its own different minerals. nature and few more by the river. All except one rotenburo (which for women only) are mixed baths. but it actually sits on top of the cliff so it has one of the best views in the area. The ryokan was first opened in 1890 and offers great Japanese food and hospitality, Best time to visit the area is late autumn when the entire valley is turning in to red forest but problem with that is there will be so many cars and people, you can't really enjoy the tranquility of the onsen. springs from general public so it doesn't get spoiled. 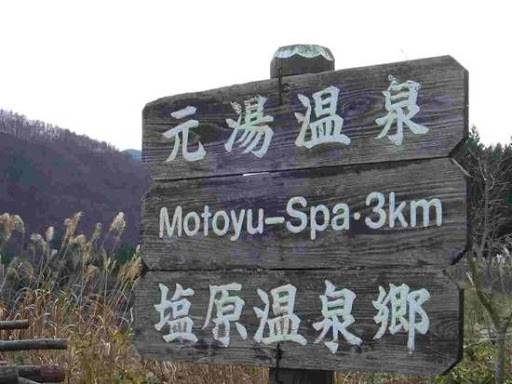 One of the secret hot spring is Motoyu in Okushiobara. There are three hot spring Japanese inns in the area. 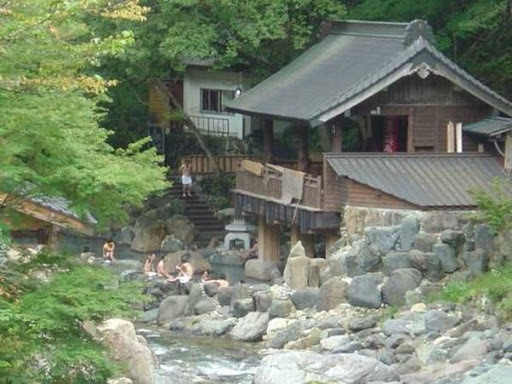 Gensen-kan" is famous for its rustic onsen settings (picture below) and the other is "Ooide-kan" (picture above) which is on the hill above Gensen kan. Ooidekan is also called as a "black hot spring (Sumi-no-yu)" because its ink like black water. At the entrance, a sign says not to bring the towel in to the bath because it will dye black. There are rotenburo (open-air bath), and the mixed bathing of the famous black water hot spring and a separate women's bath. Gensen kan has one women's bath and one mixed bath. Tel 0287-32-3221. Chichibu has so many onsens however it tooks me several trips there to find a nice onsen that I liked. Nagatoro river rafting. It's amazing to see how these wooden rafts can navigate through rough waters and rocks in between. Nagatoro's soba and veggie fry. A lady name Sako-san sent me email one day asking me to add her onsen and her beautiful village in Sawatari which is a hot spring resort with over 800 years of history. I haven't been to the spa yet but it looks beautiful and next time when I'm in Japan, I will definitely will visit. According to Sako-san, "Sawatari spa is really off the beaten track, only few foreigners, even Japanese know. But everybody who came here said that it is really a nice place and nice water"
Following are few examples of Japan's Mixed Baths in Korean language. 일본엔 약 2만 곳의 온천이 있다고 한다. 옛날엔 여기저기에 흩어져 있던 온천과 료깡(여관)들을 17세기의 도꾸가와 막부에서 정리를 하여 지금의 온천과 여관을 만들었다고 한다. 높은 산과 들 사이에서 소리 없이 영업하던 온천장들도 그 당시에 모두들 등록을 하여 일본에는 300~400년 된 온천장들이 부지기수다. 시마(四万) 온천의 세끼젠깐(積善館)은 일본에서도 가장 오래된 온천 건물로서 1691년에 지어졌다고 한다. 예전의 온천 건물들은 모두 없어지고 지금은 1930년대에 지어진 목욕장 내의 5개의 욕탕들이 타일들을 사용해서 만들어졌지만 아직도 노스탈직한 기분을 자아내게 하고 있다. 도로에서 세끼젠깐 을 이어주는 빨간다리 에서 바라보는 풍경은 정말아름답다. 아래층의 아치형 창문은 호시온센의 초주칸 에서 후에 카피를해서 썼다는 얘기가있다. 일본의 온천들은 원래가 혼욕이었다고 한다. 명치유신(1860년대 말) 이후부터 점차 외래 문명을 받아들이면서 없어지다가, 2차 세계대전 이후 맥아더 군정에서 외국의 생활양식들을 도입하면서 거의 사라지고 없어지고 말았다고 한다. 지금도 오래된 온천들을 가보면 가운데를 갈라서 벽을 만들어 남과 여탕을 막아놓고 있지만, 대부분 엉성하기 짝이 없다. 원래 없었던 것을 막아서 그런 것 같다. 이까호 온천의 노텐부로(露天風呂: 노천온천)를 가면, 오래된 욕탕 가운데 칸막이를 엉성하게 설치했지만 자세히 보면 그런 식의 디자인이 아닌 걸 알 수 있다. 옛날의 욕탕 사진들을 보면 혼탕이었던 것을 알 수 있다. 일본은 아직도 혼탕이 많다. 잘 찾아보면 이곳저곳에 혼탕들이 많이 존재하고 있다. 대부분의 혼탕들은 산속의 후미진 곳에 위치하고 있지만 어떤 경우에는 큰 온천 촌에서도 찾을 수도 있다. 대부분의 혼탕은 남녀가 같이 탕 속에 들어가지만 여자들은 큰 수건으로 가릴 곳을 다 가리고 남자들만 앞만 겨우 가리고 다닌다. 어떤 일본 남자들은 아예 벋고 다니는 경우도 있지만, 대부분 걸어 다닐 때는 앞만 조그마한 수건으로 가리는 흉내만 낸다. 창피해서 그런 것 보다는 에티켓으로 그러는 것 같다. 홀랑 벗고 혼탕에서 걸어 다니는 남자들을 보면 좀 덜 된 것 같았고, 가정교육을 덜 받은 사람처럼 보이기도 했다. 혼탕이라고 대단한 것은 아니다. 남자와 여자가 같이 욕탕에 있다는 그 자체가 중요한 것이지 꼭 뭘 봐야 되는 것이 아닌 것은 아닌가? 대부분의 혼탕들은 밤이 되면 커플만 남고 혼자로 온 사람은 없어진다. 혼자 와서 낮에 온천을 즐기고 밤까지 자면서 온천을 즐기는 사람은 없어서 그런 것 같다. 어두운 밤에 연인 둘이서 모두 벗고 온천을 즐기는 모습은 참 아름다워 보였다. 특히 타카라가와 같은 노천 온천에서 달빛을 바라보며 흘러가는 강물소리 들으며 가져온 일본 정종을 온천물에 데워서 마시고 있으면 마치 신선이 되어 선녀와 온천을 즐기는 듯하다. 타카라가와 온천은 일본의 10대 명장(유명 온천장)으로 알려지고 있는데 노천 온천(로텐부로)은 정말 아름답다. 강을 사이에 두고 양편의 로텐부로는 참으로 파라다이스를 방불케 한다. 혼욕은 나처럼 혼자로 다녀도 재미있지만 역시 사랑하는 연인끼리 가서 살 맞대고 온천을 즐기는 것이 제 맛 일거다. 거기다 비가 부슬부슬 내리거나 눈이라도 내리면 금상첨화일 것이다. 일본 료깡은 어딜 가든지 들어가자마자 신발을 벗고 샌들로 갈아 신어야 한다. 물론 맨발로 다녀도 되겠지만 남들이 흉보는 것 같다. 료깡에서 제공하는 샌들을 신고 료깡 주인을 따라 방으로 안내 되서 들어가면 방 안에는 유카타(기모노 같은 겉 옷)가 있으니 갈아입고, 온천으로 직행을 한다. 온천을 해지기까지 즐긴 후 돌아오면 저녁 식사가 준비되어 있으니 저녁을 들은 후 좀 쉰 후 사케 한 병과 플라스틱 컵을 가지고 혼탕 온천으로 향한다. 도착 후 사케를 온천에 데운 후 플라스틱 컵으로 한 잔하면 최고다. 웬만한 료깡은 모두 저녁 식사와 아침 식사를 료깡비에 포함한다. 아침에 식사 후 온천을 즐긴 후 11시나 정오 쯤 체크아웃 한다. 메이지 시대 풍의 오래된 건물에 남녀 탕이 따로 있으며 강가 옆에 혼탕이 있다. 남녀 탕에서 계단으로 내려가면 조그만 혼탕이 있으며 이곳은 작고 아담해서 한 두 연인들만 들어가도 꽉 찰 것 같이 작다. 분위기는 참 좋다. 이곳에 묵으면서 근처 관광하는 것도 좋다. 칸엣수 고속도로 혼조 IC에서 13 Km 거리(20분)이니 교통도 편하고 나카토로 강과 많은 온천들이 근처에 있다. 거의 모든 군마현의 온천들이 이곳에서 2~3시간 거리이다. 근처엔 골프장도 많고 음식 맛도 참 좋다. 이곳의 물은 정말 좋다. 여기서 온천을 하고 나면 피부가 매끈거리고 그 기분이 샤워할 때까지 가는 것 같다. 남탕과 여탕 안에는 갈색 앙금이 많이 나오는 찬물도 있어서 열탕 냉탕 왔다 하기는 참 좋다. 신수관에는 두곳의 탕이있다. 윗층은 남녀가 따로하고 아래층 에는 혼욕탕이다. 근처강에서 잡은 송어훈제요리와 고베비프 저녁은 일품이다. 예약할때 저녁이포함된지를 확인하는겄이좋다. 시오바라의 오디데칸은 흑탕(검은 물 온천)으로 유명하다. 이곳은 찾아가기도 쉽지 않지만 비밀의 탕으로도 이름이나 있다. 아는 사람은 아는 곳이겠지만 일본 내에서도 잘 알려지지 않은 비탕이라고들 한다. 이 동네에는 료깡이 세 곳이 있는데 세 곳 다 들를 만하다. 제일 아래 있는 탕은 작지만 탕 자체가 예쁘고 물도 좋고 분위기도 참 좋다. 물은 갈색 녹색 섞은 물 같지만 가끔 검은 석탄 물도 나오곤 한다. 탄산가스 같은 혹은 계란 썩은 냄새도 나고 분이기도 있다. 이곳은 혼욕이 아니지만 여기까지 왔으면 꼭 들르기를 권유한다. 혼욕 탕은 제일 꼭대기에 있는 오데이깡에 있다. 이곳은 일곱 곳의 탕이 있으며 흑탕은 한 곳이다. 흑탕(수미노유)은 혼욕으로서, 들어가는 입구에 수건을 두르고 들어가지 말라고 써 놓았다. 흑탕에 수건을 두르고 들어갔다 나오면 석탄 물이 들어서 그러는 듯 했다. 그런 탓에 이곳은 남녀가 모두 벌거벗고 들어가야만 한다. 물속에 들어가면 아무것도 안 보이는 흑탕이니 별 이상한 게 없지만, 그래도 처음 오는 사람은 겸연쩍을 것이다. 일본 여자들은 잘도 하는 것 같다. 이런 흑탕은 일본 전체에서도 보기 드문 곳이라 한다. 물의 검은 정도는 물에다 먹을 진하게 갈아 놓은 듯하다. 흑탕 외에도 가족탕이 있다. 이곳은 연인들만 들어가는 곳이라 한다. 남탕 여탕이 따로 있으며 노천온천의 경치 또한 좋고 물도 참 좋다. 얻어들은 역사에 의하면 이곳은 천년 이상 된 온천 촌이라 하나 1659년의 대지진에 의해 한 마을이 다 무너지고 지금은 이 곳 세 곳만 영위되고 있다고 한다. 지금도 9월이면 매년 온천 축제가 열리다고 한다. 9월 쯤 들리게 되서 온천 축제도 보고 온천도 하고 하면 좋을 듯하다. 이곳의 흑탕물은 그 축제 때 떠다가 온천 신에게 바친다고 한다. 汪泉閣은 大正 12년에 개업했으며 노천온천에는 여탕이 한 곳이고 혼욕장이 세 곳이나 있다. 타카라가와 온센은 칸엣수 고속도로를 북쪽으로 타고가다 미나까미(水上) IC에서 내린 후 북쪽으로 한 30분 들어가면 있다. 온천 촌에 들어가기 전 강이 있는데 이 강의 다리에서 바라다보는 양편의 산들이 절경이다. 비가 오는 날이면 강의 온천물이 어울러져 안개를 띄우며 신비스러운 모습을 자아낸다. 타카라가와 온천엔 2~3 곳의 료깡이 있지만 그 중에서도 오센가꾸가 제일 운치가 있다. 이곳엔 당일치기도 괜찮지만 진정한 참 맛을 느끼려면 강 건너 편에 있는 옛날 건물 료깡에 일박하면서 구름다리를 건너 웅장하게 펼쳐진 로텐부로를 왔다 갔다 하면서 오래 즐기는 것이 최선이다. 이곳은 일본의 10대 명장 안에 드는 온천이라 하지만 많은 온천 인들은 이곳의 로텐부로가 최고라는 평을 한다. 온천으로 가는 길은 이곳 료깡 주인이 모아 놓은 옛날 골동품 창고를 지나가는데 이것저것 볼만하다. 그 안에 찻집도 있고 내탕도 있으니 꼭 들를 만하다. 이곳은 너무 유명한 탓에 외국인도 많이 온다. 어떨 때는 여기가 록퐁기인가 잘 못 느낄 정도지만 밤이 되면 모두 사라진다. 그때는 정말 두 연인의 최고의 순간이 될 수도 있다. 암벽으로 막아 놓은 자연 온천사이에서 혼욕을 즐기는 맛은 두 연인이 아니고서는 쉽게 느끼는 못하는 감정이며 경험일 것이다. 일본에서 돌아다니려면 렌트카가 최고다. 마일리지 제한 없는 조그만 차하나 빌려 갖고 여기에 적혀있는 전화번호만 GPS에 누르면 어디든지 찾아간다. 괜히 신간센이니 버스니 타고 다니지 말고 경제적으로 맞는 차를 타고 찾아다니는 것이 기동력도 있고 짧은 시간에 많이 다닐 수 있다. 그리고 꼭 기억할 것은 돈 아끼지 말고 고속도로 타고 다니라는 것이다. 조금 아끼려다가 동네 도로에서 시간 다 허비한다. 기동력이 최고다. 잘 계획하면 하루에 두 세 곳은 쉽게 즐길 수 있다. 유모리타나가야 료깡은 시오바라온센을 가기 전에 위치한 오마이 온센에 있다. 개업하기를 1890년에 했으며 노천탕은 여탕 하나 혼욕 탕이 세 곳이 있다. 이곳은 참으로 자연적 경관이 뛰어난 곳이고 신비적인 온천이라 볼 수 있다. 오아미 온천을 갈려면 이 여관의 주차장에 주차를 하고 여관 안에 가서 돈을 내고 한참 걸어서 절벽을 타고 강가로 내려가야 한다. 국도 옆에 위치한 료캉은 별 특색 없어서 스쳐 지나가기가 쉽다. 잘 보고 가지 않으면 지날 수도 있으니, GPS를 잘 봐야한다. 오아미 온센은 위에 여탕이 하나 있고 그 밑에 큰 혼탕 로텐부로가 있다. 그 밑으로 강 옆에 조그만 탕이 두 곳이 있다. 이곳에 연인들이 들어가 앉아 있으면 세상 가는 줄 모를 것이다. 더우면 나와서 강물에서 수영을 하며 식힐 수도 있고 암벽으로 둘러 쌓인 오아미 온센은 참 절경이다. 물도 감촉이 좋고 적당히 뜨겁고 관리를 자연적으로 잘한 듯싶다. 혼탕 쪽은 옷 갈아입는 곳도 별로 없다. 그냥 서서 갈아입어야 하고 옷은 나무 박스 같은 곳에 정리하여 놓으면 된다. 붐비는 국도 옆에 있어서 많은 사람들이 올 듯싶지만 의외로 많지가 않다. 저녁이 되면 호텔에서 숙박하는 연인들이 많이 내려온다. 온천비도 싸고(500円), 분위기도 좋고 경치 아름다운 오아미 온센은 몇 번씩 들려도 정겹기만 하다. 호시온센의 초주칸은 明治 28년에 개업한 이래 그대로 그 모습을 지니고 있는 일본 명장 중의 한 곳이다. 초주칸의 목조건물은 130년이 지난 후(1875년 개업)에도 아직도 아름다운 모습을 지니고 있다. 지붕은 넙새 기와도 올렸고 거목으로 기둥과 대들보를 장식하여 웅장하지만 자세히 보면 세심한 곳까지 신경을 쓴 장인의 작품인 듯하다. 호시온센은 여탕이 한 곳이고 혼욕 탕이 한 곳이 있다. 혼욕 탕의 입구는 남탕 여탕으로 갈라져 있지만 들어가면 한탕이다. 같이 어울리기를 수줍어하는 여성들은 그 옆의 여탕으로 바로 들어갈 수도 있다. 이곳의 혼탕 건물은 정말 아름답게 지어 놓았다. 아치형의 창문으로 벽을 장식했고 8군데로 갈라진 욕탕은 바닥에 자갈돌을 깔아 더욱 자연적인 이미지를 느끼게 한다. 이곳에 앉아서 건물 구경을 하다 보면 참으로 일본사람들이 온천 보존에 노력을 많이 한다는 것을 알 수도 있지만 왜 온천을 즐기는 이유를 알 것만 같았다. 물은 무색 명이지만 감촉이 참 좋다. 온천을 끝낸 후 식사도 할 수 있다. 식사를 원한다면 들어가기 전에 예약을 하는 것이 좋다. 2600円에 식사와 온천을 겸할 수도 있고 하룻밤 자면서 온천을 하려면 14,000~27,000円 까지도 한다. 거북이 탕과 산나물은 이곳의 특식으로 많이 알려져 있다. 전설에 의하면 호시온천을 1,000년 전에 개발이 되었다고 하나 지금의 건물은 130년 전에 지었다고 하며 일본에서 제일 많이 사진 찍힌 온천 건물이라고 한다. 1875년 개업. 내탕 1개, 혼탕 1개. 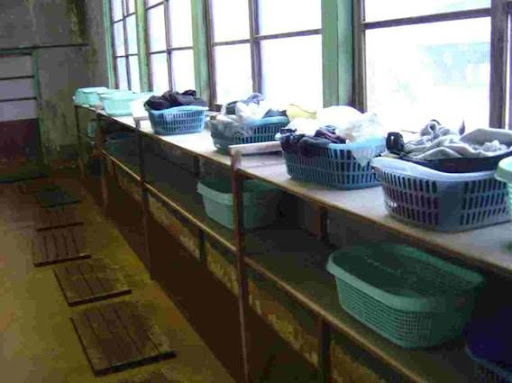 쿠삿수는 서기 1200년에 일본 에서 벌써 유명한 온천이 되었었고 이곳은 유명세는 독일의 의사 어윈 본 바엘즈(Erwin Von Baelz) 박사에 의해 더 높아지게 되었다고 한다. 그는 이곳 물의 성분을 정리하여 발표하기를 건강에 좋은 온천이라고 세계에 널리 알렸다. 이곳의 Sulfur 성분은 높아서 웬만한 박테리아는 금방 살균한다고 한다. 쿠삿수 온천의 특색은 온천 촌의 가운데 위치한 유바다께에 있다. 이곳은 일분에 5,000리터의 온수를 뿜어내는 원장으로서 일본 내에서도 온수를 제일 많이 뿜는 거장이라고 한다. 여기서 나온 온수는 나무로 만든 파이프를 통해서 식혀지며 아래의 온천 료깡으로 옮겨지게 된다고 한다. 이곳의 온천물은 각종 병과 질환을 고친다고 하고 피부 미용에도 효과가 크다고 한다. 쿠삿수 온센에는 무료 동네 온센이 약 10여 군데 있다. 도착 하자마자 동네 온천 지도를 받아서 쭉 둘러보는 것이 좋다. 쿠삿수 온천에서 조금 더 올라가면 시라네 화산이 있다. 그 산 꼭대기에는 유가마(뜨거운 물의 화산)라는 초록빛 화산 분화구가 있고 이곳의 높이는 해발 2,000미터 정도이라 무척 춥다. 여름에도 추우니 꼭 잠바를 가지고 가야 한다. 쿠삿수의 온천 박물관도 들를 만하지만 유바다께(시중심) 근처의 온천물 식히는 쇼도 꼭 관람할 만하다. 쿠삿수의 특색이라 할 수 있는 온천물 식히기는 65도 정도 되는 온천수를 기다란 나무판으로 뒤집어 식혀서 48도 정도의 온도로 온천을 할 수 있게 만드는 것이다. 이렇게 식힌 물도 들어가면 무척 뜨겁다. 다른 온천들은 대부분 42~44도 정도이지만 쿠삿수는 유난히도 47~48도 정도로 무척 뜨겁다. 쿠삿수 온천에서 물을 식힐 때는 여인들이 창을 한다. 이 전통 창은 유모미라고 하며 이 창을 하면서 온천의 뜨거운 산성 수증기를 마시면서 병을 치료하기도 했다고 한다. 근처에는 스키와 스노우 보드장도 있다. Slope도 좋은 편이고 사람은 많지만 분위기도 좋다. 쿠삿수의 야마모토칸(山本館)은 1810년에 개장한 유서 깊은 료깡이다. 쿠삿수 는오래전부터 개발한온천장이라 숙박시설들이완벽한 편이다. 아무곳에 방을잡고 두루다닐만한 온천장이다.쿠삿수 에는 혼욕장이여럿있다. 그중에서도 오오타끼노유 大滝の湯 를제일알아준다. 입장료가 800 엥 이며 24 시간오픈한다. 오오타끼노유 는완전히 목재로만 건축하여 탕들이 운치가있으며 물이뜨거운탓에 스팀이많아 여자인지남자인지 잘보이지도않는다. 이곳은 들어가자마자 대욕장이 나와서 제압을 하지만 바깥으로 나가서 노텐부로에 몸을 적신 후 계단을 내려가 지하 욕장으로 가야 제 맛이다. 이곳의 아와세유(통나무 욕장)은 정말 환상적으로 만들어 놓았다. 합해서 다섯 군데의 욕조가 있는데 모두 온도가 틀리다. 이곳은 냉수를 안타고 자연적으로 온천물을 식힌다고 한다. 특이한점은 하루에세번 여성만을 위해서만 오픈한다 'women only'. 지하 욕장은 여자들이 사용하는 시간이 따로 있어 여자가 사용 시는 남탕 쪽의 문을 잠근다. 여자 사용시간이 아닐 때는 혼욕이 허용된다. 여기서 나와서 유바다께 쪽으로 올라가다 보면 동네에서 운영하는 조그만 온천들이 두 개나 있다. 그 중에서도 니까와노유라는 나무 집의 욕탕은 정말 좋다. 물은 엄청나게 뜨겁지만 용기를 내서 풍덩 담그고 가만있으면 견딜 만하다. 쿠삿수는 정말 권하고 싶은 온천장이다. 시마온천은 시마강변에 위치한 온천도시로써 4만가지 병을치유하는효험이있다하여 1,000 년전부터 유명했다한다. 시마에는 료깡이많지만 그중에서도 세끼젠칸 은 무려 300 년이 넘게 (1694년 개업) 한건물에서 꾸준히 온천을 열고있다. 강옆에 자리한 노천욕장은 폭포와 둘러쌓인 숲과 더불어 운치를자아낸다. 시마에는 서너곳의 동네 무료욕장들이있다. 그중에서도 야마구찌 로텐부로 山口露天風呂 는 강옆에 위치한 혼욕장으로 많은 남녀들이이용한다. 길옆에있으니 찾기도 좋지만 항상 안내소에들려 지도를받아갖고 다니는겄이좋다. 도로에서안보이게 칸막이를했지만 내려가면 4 곳 의 돌로 만든 혼탕들이있다. 위쪽이뜨겁고 내려올수록식히는방식을 사용했다. 시마의 많은 욕장중 작은 료깡 인 中生館 (추세이칸) 도권할만하다. 이곳은 혼욕 로텐부로 가 없지만 길 건너의 강가에 조그만 동네 온천이 있다. 이곳은 무료이며 숲에 묻혀 있고 조그만 강물이 흘러가고 분위기 만점이다. 일본의 료깡은 예약하지 않으면 안 된다고 보면 거의 맞다. 가기 전에 꼭 전화를 걸어 예약을 하는 것이 좋다. 가서 봐 달라고 우겨서 될 일이 아니다. 점심 한 끼 돈 내고 먹자해도 예약을 안 했으면 안 된다고 한다. 예외 없다. 일본의 많은 온천 여관들은 투숙객에게만 온천을 제공하는 곳이 많다. 어떤 온천 여관들은 돈을 따로 받는 곳도 있지만 대부분 여관비에 온천비가 포함되어 있다. 낮에 가서 온천만하는 온천이나 여관들은 대부분 300円에서 800円 정도 받는다. 온천촌내의 동네 온천들은 대부분 무료봉사이다. 쿠삿수(草津)의 동네 온천은 참으로 좋기도 하지만 무려 10군데가 무료이다. 하루 날 잡아서 쭉 도는 것도 무리가 안 되면 참 좋은 일이다. 이까호 온천은 일본 유수의 온천이다. 이까호 온천장에는 40~50여 곳의 큰 호텔과 그 정도 수의 료깡이 있어 아주 대규모의 온천 촌을 이루고 있다. 그중에서도 원천격인 이까호 로텐부로는 예전엔 혼욕 장이었지만 지금은 반을 갈라서 막아 놓아서 따로 분리되어 있다. 주변 경치가 참 아름 다와 많은 사람들이 모여 든다. 특히 단풍 시즌에는 이곳의 붉은 색 다리가 단풍과 어울러져 절경이다. 혼욕 장은 아니지만 꼭 들르길 권한다. 후회 안 할 테니 꼭 가봐라. 이까호 로텐부로는 이까호 온천지 밑에 위치하여 여기서 나온 물들이 이까호 가운데를 통해서 흘러 내려간다. 이까호 는일본유수의 온천 위락지로서 서기 700 년에 온천촌으로 시작했다는역사기록이있다. 이까호 의특징이라할수있는 360 계단 이시단-가이 는 꼭대기에있는원천에서 아래여관 들로 뜨거운물을보내는 수로역할도하고있다. 노천 온천을 당일치기로 (Day Dipping)갈 때는 마른 오징어튀김이나 닭튀김 같은 것을 가지고 가서 온천 들락날락하면서 허기질 때 우롱차와 함께 마시면서 먹으면 좋다. 어질지 않고 먹은 후 싸 가지고 나가면 눈살 찌푸릴 일도 없고 건전하다. 온천을 하다 보면 위가 압박을 받아서 그런지 쉽게 허기가 지는 것 같다. 동네 국수집 가서 메밀국수를 새우튀김에 같이 한 그릇 사 먹는 것도 좋은 생각이다. 800년 전에 처음 개장을 하여 많은 보수를 거듭한 카가이 온천의 이찌요깡은 탄산가스가 많이 나오는 온천이다. 시골의 오래된 왜정시대의 소학교를 연상케 하는 건물은 노스탈직하면서도 정감이 간다. 혼탕이 아니지만 나가노시 근처에 갈 수 있다면 한번 들러볼 만한 곳이다. 이 온천은 고속도로 근처에 있는 욕장이라 시간도 많이 안 걸리고 분위기도 괜찮으니 한번 들리기를 권장한다. 입장료는 300円이니 거의 거저이고 주인아저씨의 친절함에 놀랄 수도 있다. 노텐부로도 조그맣게 있고 물이 참 부드럽고 앙금이 맑은 천연 자연수이다. 일본은 온천을 4 가지로 온도별로 분류한다. 일본은 팁이 없다. 봉사료가 요금에 포함되어 있으니 따로 줄 필요가 없다. 그러나 돈 싫다는 사람이 어디 있으랴? 그곳의 할머니나 일하시는 분의 서비스를 더 원한다면 돈을 (2,000~3,000円)을 봉투에 넣어서 살짝 밀어주면 받는 분들도 있다. 하지만 권할 일이 아니다. 아까기 온천은 별로 특색도 없고 썩 권할 만한 온천이 못된다. 사람들이 왜 이 온천을 찾는지 이해가 안갈 만큼 별 볼일 없다. 다만, 이 온천을 가기 전에 있는 신사와 주면 온천들은 들를만하다. 가을의 단풍도 좋고 아까기 온천을 지나 산길을 따라 니꼬로 넘어갈 수도 있어 이쪽으로 발길(차 길)을 돌리는 것도 괜찮다. 아까기 온천은 혼욕이 아니다. 아까기 온천을 올라가기 전에 있는 아까기 신사는 전나무 숲에 쌓여 있는 환상적인 신사다. 오래된 신사이기도 하지만(확실히는 모르고) 숲속에 위치하여서 인지 햇빛도 못 받고 있는 듯하다. 여기에 있는 약수는 물맛이 좋아 멀리서 들 와서 퍼 간다. 이곳에서 나와 조금 더 아까기 온천 쪽으로 가다보면 추지(忠治)온센이 있다. 이곳은 에도 시절에 유명한 한량인 쿠니사다 추지라는 사람이 도망 와서 숨어 지내서 유명하다 한다. 추지 온센의 료깡은 참 예쁘게도 지어 놨다. 안에 들어가면 완전히 에도시절 건물을 그대로 보존해서 분위기 있다. 물론 고쳤겠지만 아직도 에도풍이다. 추지칸의 온센은 별 특색이 없다. 절벽 위에 위치하여 가을 단풍 때는 아름답지만 권할 만한 온천이 아니다. 혼욕도 아니고 별 볼일 없다. 다만 추지칸 건물은 분위기 있고 볼만하다. 이곳 보다는 차라리 이 옆의 온천인 潼尺이 더 볼만하다. 여기까지 올라왔으면 세 온천 모두 들려도 괜찮은 것 같다. 추지깐 근처의 호타까 온천도 볼만하다. (0272)83-3015. 카야노레 료깡은 학교에서 운영하는 조용한 료깡이다. (0278)52-2234. 온천의 물은 대부분이 미네랄을 함유하고 있다. 뜨거운 물이 몸에 닿으면 기공이 열리고 그 사이로 미네랄들이 몸에 들어가 신체에 도움을 준다고 한다. 작게는 피부염이나 크게는 신경통, 근육통 등을 치료한다고 한다. 온천 후에 수돗물로 씻어버리는 미네랄은 몸에 도움이 덜 될 것이라고 하여, 온천 후 약 6~7시간은 샤워를 안해야 그 동안 미네랄들이 몸속으로 들어간다고 한다. 온천마다 온천수가 뿜어 나오는 곳에 컵을 갖다 놓았다. 이 물들은 신진대사를 활발하게 해 준다고 써 있다. 만자 프린스 호텔온천은 해발1,800 m 에위치한 고산온천이다. 만자고원은 도꾜에서 가까운탔에 별장들이부지기수로있으며 겨울에는 스키 스노우보드장으로 각광을받고있다. 만자 프린스 호텔 내에있는 혼욕 온천은 계곡사이에 위치해 여러곳 의따로떨어진 탕을설치해서 즐기기가 안성맞춤이다. 특히 스노보드타고 지친몸을담구면 피로함이 눈녹듯이 녹아버린다. 호텔안에 여성전용탕이있지만 대부분의 여성들은 바깥의 혼탕을이용한다. 일본에는 온천이 천지이지만 나는 주로 간또(關東)지방의 온천들을 다녔다. 여기에 적혀있는 거의 모든 온천은 나리타공항에서 내려서 렌트카를 타고 2~4시간이면 도착할 수 있는 곳으로만 한정하여 적어 놓았다. 도쿄북쪽의 군마겡과 도치기겡은 일본 내에서는 온천장이 제일 많은 곳으로 알려져 있다. 물론 나가노 현이나 더 올라가서는 아오모리 현에도 좋은 온천이 많겠지만 군마(群馬)현만큼 온천의 보고는 없는 듯싶다. 일본에 2만군데 이상의 온천이 있다니 얼마나 좋은 곳이 많겠냐 싶지만 나는 그만큼 시간도 없고 여유도 없고 해서 군마 근처만 많이 다녔다. 정말 마음 같아서는 일본에서 정년퇴직하여 온천 여행이나 다니면 좋겠다 싶을 정도로 좋은 곳이 많지만 군마, 도치기, 나가노 쪽만 다닌 걸로 만족해도 괜찮을 것 같다.